There are three different categories of membership. You can sign up online or via mail. Please review the categories, sign up, and you will receive your welcome packet with more information! Membership dues will be due and payable upon receipt of application for membership. The amount of the annual dues may change from year to year. Annual dues are payable each year on or before the date of original membership. Please consider a contribution (non-deductible) in addition to your dues. 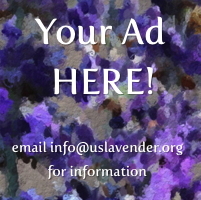 You would be helping in the growth of the United Sates Lavender Growers Association.